Sounds like a Scooby-Doo plot, but it is also known as the Oak Island Money Pit. It is called that because of the long list of people who have spent their lives-and all their savings trying to get to the bottom of it. Some have even given their lives in the search. Now I hear there is a TV series on it, which I believe is yet another attempt to gain funds to continue the digging and search. On an island just of Nova Scotia, Canada, is what is called Oak Island. In 1795 a young man named Daniel McInnis (or McGinnis) was roaming Oak Island when he came upon a large round shallow depression in the ground where no trees grew. As there was always talks of Pirates in those days he thought it may have been where some pirates had hidden their loot, so he started digging. After finding a layer of flagstones he gave up, but returned with more friends the next day. They got down another 10 feet and found a layer of rotten oak logs. They dug another 15 feet but gave up looking, still convinced there was something down there. They returned in 1803 with a businessman as the Onslow Company and did a lot of excavation. layers of logs were found about every 10 feet, along with clay, charcoal and coconut fibres. Then at around 90 feet they discovered a stone with strange markings in code, and probing beneath it some kind of wooden chest, but left it for the next day. By morning the pit had flooded with over 60 feet of water. Attempts to bail it out proved futile as it kept flooding. Another pit was sunk adjacent to the first, but this too was flooded. Eventually they gave up. in 1849 another group, the Truro Company, used a hand-operated auger to remove cores of material. They found clay, bits of wood, and three links of gold chain-supposed evidence of buried treasure. They dug additional shafts, but these, too, were inundated with water, and work stopped 1850. Other operations continued during which time a workman was scalded to death by a ruptured boiler. Decades passed. In 1897 the Oak Island Treasure Company found the long-sought after “pirate tunnel” that led from Smith's Cove to the Money Pit. They drilled and dynamited to close off the tunnel that was responsible for flooding the pit with sea water.. Subsequent borings found a fragment of parchment upon which was penned portions of two letters (possibly “ri").Later this same year Oak Island's second tragedy struck when a worker was being lifted from one of the pits and the rope slipped from its pulley, plunging him to his death. In 1965 there came yet another tragedy when four men died in a shaft after being overcome either by swamp gas or engine fumes. I do believe it was constructed by Pirates as a means to hide loot, but is not as simple as just a hole full of treasure as most people believed. 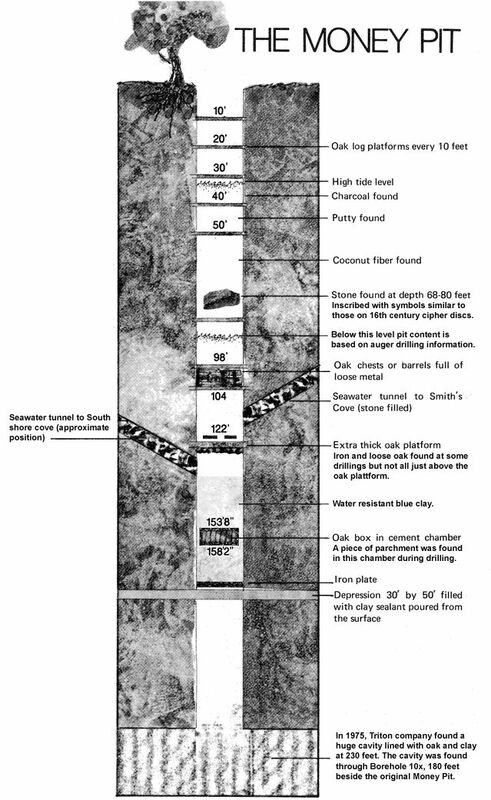 Many believed that tunnels were dug out to the beach as a means to booby trap the pit to make it flood with water intentionally, but I believe th eopposite was actually the purpose based on who actually dug the pit and how. First - That it was dug by pirates for pirates. The location was ideal - a small Island on a common Pirate route, uninhabited and suitable for hiding treasure, but also all the other things needed - like food, gunpowder, drinking water. Initially they would have had a pit, covered with logs, coconut fibre then sand, but as everyone got to know the location, it was not very secure. In other areas they use caves to store their goods - some of which were only accessible at low tide, and some only at certain times when an exceptional low tide was caused by the influence of the moon. What they needed was to Make an artificial man-made Cave! Digging such a cave is next to impossible. They would only be able to work at the very low tide level occasionally, and to hollow out the structure would take years like that - So they started off by digging a large pit - then dug outwards to reach the sea. There were ways to dig underwater. A primitive diving bell was around that used bilge pumps to pump air into an upturned container - that forced the water out by air pressure. Once the main pit was dug - it was covered in logs to make a room, and an air-tight door installed at the top, another room and door followed, and the air pumps connected to ensure that when water was reached - it would not kill those digging. Eventually the tunnels did connect to the sea, but due to the increased air pressure - they did not flood. What they had just created was a giant diving bell ! Access was from underwater at the beach, but after that you could walk along the tunnels as the cave was pressurised. This is why I believe there are so many layers of logs sealed with coconut fibre and clay because it was essential that it was airtight from that end. If it was not, then anything stored in there would get wet. - It was never intended to be dug up from the Money Pit location ! When gunpowder gets wet - it goes sour. As it contains sulphur and oxidising agents it decomposes and gives off sulphur dioxide - a toxic gas. This is what I believed killed the workers when they breeched a tunnel. It would have flooded a bit due to leaks, so all that was needed was to bring the bilge pumps onshore from the ship, pump air in through pipes and wait for bubbles to rise at the shore - showing the tunnels were now empty and "open". This was their security. Only they knew the location of the pipes, and the location of the cave entrance - plus you needed to know the method to fill it with air too. Any other pirate would not have a clue of the way in or have the ability to clear the tunnels, so was secure by the fact it needed secret knowledge and tools to get in there. Nova Scotia also had what was known as the Treasure Trove Act (“TTA”), which was the only one of its kind within North America, and allowed those with a license to seek and remove treasure found within a certain area. “Treasure” was considered to be “precious stones or metals in a state other than their natural state”. While it was in place, although the TTA and the SPPA were not connected, the TTA took into consideration the permits required by the SPPA. Despite this, there was much controversy related to the TTA, as it was seen to have treated “archaeological or heritage objects as a natural resource with commercial value”. The TTA was repealed, and as of December 31, 2010, licenses to all activity, except for those pertaining to Oak Island expired. i am sure discovery channel just loves this topic. As for me, I dont give a hoot who finds what, on the supposed island of lost treasures maybe someday the mystery will be told as the discovery channels big earner. I think i read on this site ( i added the title just 2 be safe) Astrology Junction: Astrology,Horoscopes,and Tarot something about that like about a lost treasure. IDK 2 be exact where it is right now but it use to be linked to the homepage, now i cant find it. Well, thanks for sharing this! I def did a bookmark just now, so i can re -read this again in my spare time. Quick question for u all, Can i add an avatar here??? I've watched the show on the History channel and I've read up on it since i was a kid. I've always thought it was pirate treasure, but then with all of the theories being proposed on the TV show regarding the knights templar i wonder if maybe, just maybe there is something far more important hidden there.